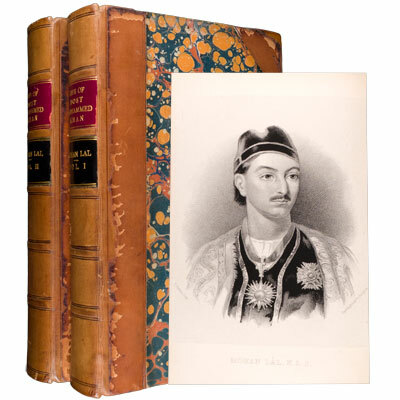 Life of the Amir Dost Mohammed Khan, of Kabul; with his political proceedings towards the English, Russian, and Persian governments, including the victory and disasters of the British army in Afghanistan - Mohan Lal 1846 - Longman, London - First Edition	A rare and important work. Illustrated with nineteen portraits printed on India paper. Lal, who was attached to the British mission to Kabul, had prepared an account in English and Persian which was lost during the chaos of the War, but he later put the story together again. In his Preface, Lal apologises to the reader for his abundant errors both in grammar and idiom and explains that anecdotes about the Amir's adventures and morals were generally communicated to him second-hand. However, the book, which contains illustrations and draws on personal correspondence, is a fascinating account of the ruler himself and of his political dealings with the English, Russian and Persian governments at the time of the 'Great Game' in Central Asia. [CUP]	Dost Mohammed Khan, (born 1793, Afghanistan—died June 9, 1863, Herat), ruler of Afghanistan (1826–63) and founder of the Barakzay dynasty, who maintained Afghan independence during a time when the nation was a focus of political struggles between Great Britain and Russia. [Encyclopaedia Britannica]. Mohan Lal Zutshi (popularly known as Mohan Lal Kashmiri; 1812-77) was a traveller, diplomat, and author. He played a central role in the First Anglo-Afghan War of 1838–1842. His biography of Dost Mohammad Khan, emir of Kabul, is a primary source on the War. Provenance: Charles G. Howard, with his armourial bookplate and note that this was a gift of ‘The Rt.Hon. Sir David Dundas’ 1877. Later of Arnold J. Toynbee with his inscription dated 1921.